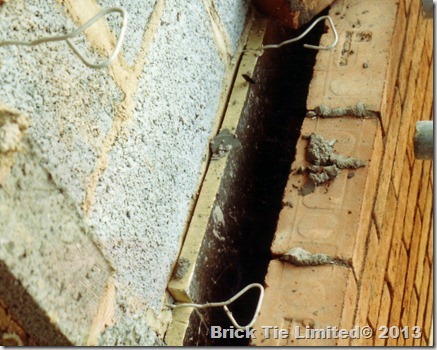 You are here: Home / Cavity Wall Ties / What are wall ties ? Wall ties are unseen metal components of all cavity walls. Built into the wall by the builder as he constructs the wall. They are crucial to the stability and safety of cavity walls and here’s why. When you look at a house constructed of brick or stone, built after the first world war, you are probably looking at a cavity wall, with wall ties present. A wall that cannot stand up straight without the cavity wall ties within. The above shows stainless steel wall ties exposed. Note these are too short to reach into the outer skin of brick. This is called poor embedment and is a common defect is new build housing. There are two parts to the cavity wall; the inner leaf and the external leaf. Sometimes called inner skin and outer skin brickwork. The reason why the wall ties are so important is due to the relative thickness of the outer skin, in relation to its height – this ratio between the thickness of a wall and it’s height is known as the ‘slenderness ratio’. Structural engineers calculate this by finding the walls ‘radius of gyration’, but we are not structural engineers so we’ll use the rough guide, which is easier…. For example if a wall is 110mm thick (the rough thickness of a standard brick), and is 1 metre tall it would have a slenderness ratio of 1:9 – the wall is nine times taller than its thickness, or the thickness is a 9th of the height (both mean the same thing). So an average house wall of say 5 metres high has a slenderness ration of about 1:45. That is a very high slenderness ratio, which means that a wall built that high and so thin, without support could be pushed over by a gust of wind or a child’s hand. Think about a the popular game Jenga, where you take turns to put wooden blocks on top of each other; it gets very hard as the column grows; it becomes very unstable due to the increasing slenderness ration. This applies to all cavity walls and it’s why wall ties are so important. What about the inner skin? Well this is built of a similar material, usually brick or block work, but sometimes timber these days. It too would have the same slenderness ration, if it were independent like the outer skin. However, the inner skin benefits from lots of support, which cancels out the slenderness and makes it rigid. These include: the floors joists and such which bear into it; the ceiling joists, which may also brace it; the roof too, which is built upon it and in modern housing securely strapped to it also. These things provide horizontal ‘lateral restraint’. Then there are the internal walls which divide the rooms, these brace the inner skin, providing vertical ‘lateral restraint’ also. The weight of all the floors, roof and such also gives support to the inner skin. Think; if you built a small wall, say ten bricks high, without mortar and then sat on it, a child could not push that wall over; this is load providing stability. Now stand up as the child is pushing and the wall would fail – easy to understand. So with a cavity wall we have a very stable box-like structure, which has load providing more stability. However, it is encased in a very unstable independent structure, which only has its ‘self-weight’ and no bracing to provide lateral restraint. If you were to take down the external skin of a cavity wall, the house behind would not look very nice, damp may get in but, it would not fall down. So, wall ties provide a lifeline for our thin weak outer skin. 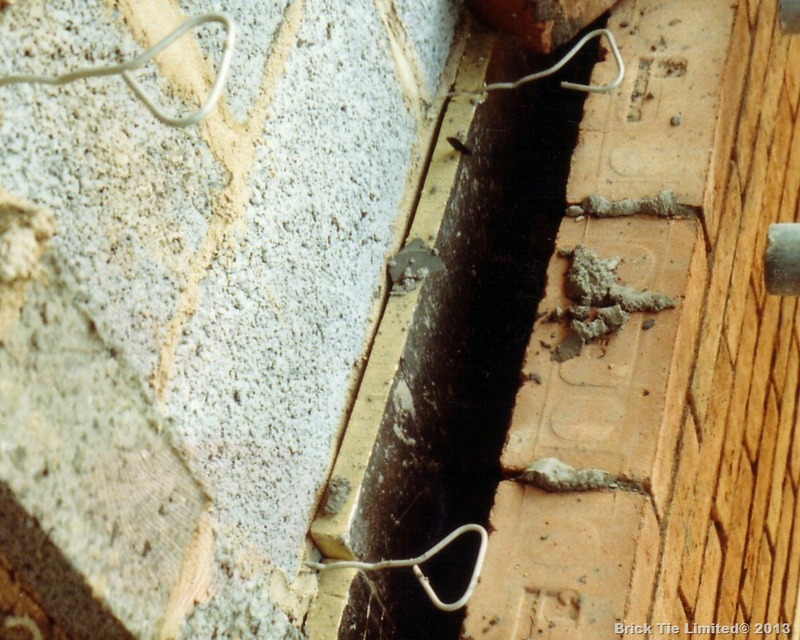 Spaced at regular intervals horizontally and vertically, cavity wall ties borrow some of the house stability and transfer that to the outer skin. Thus in effect the outer skin forms part of the overall thickness of the wall, reducing the total slenderness ratio by a mile and hey presto a stable wall which should last for years. Wall ties are usually metal, though plastic and now some composite materials are being used. They need to be strong enough to hold the external leaf up but they are also designed to allow some slight movement, so that the external leaf can move slightly as it warms up and cools. Wall Tie Corrosion is the huge legacy left over from decades of building cavity walls with mild steel wall ties. These days the metal used for wall ties is stainless steel, but for a long time, mild steel was used with either a paint film or a zinc coating for protection. These coatings do not last and when wall ties corrode, the problem is a structural one and has to be countered. As can be seen below, wall tie corrosion can cause wall tie failure, which is not very nice. My wall tie specialist business was started in 1986 specifically to deal with the wall tie corrosion threat and we’ve been busy installing new cavity wall ties on a daily basis ever since. Now you know the answer to the question what are wall ties ? The next post onthis subject will answer; What is wall tie corrosion ? If you have a wall tie corrosion problem or just need a wall tie survey or wall tie report contact my Yorkshire based wall tie replacement company Brick-Tie Limited est 1986. One of the leading manufacturers of wall ties for new houses in Ancon. 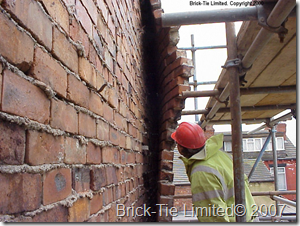 If you want remedial cavity wall ties of the sort professionals like Brick-Tie use, try Helifix. Had a full survey on my mid terrace house 2 years ago in stalybridge which came back fine. The walls are all looking great and straight. I’ve sold the house and the homebuyers report which we all know was invented to screw people outta more dosh when getting a mortgage has come back and said the ‘may be’ some wall tie failure. But the report fails to point out where. My question is how can the report say ‘maybe’ and not definitively??? This does not sound right to me, and now the buyer is trying to angle for a massive reduction….spoke to surveyor and he said he doesn’t trust that report at all. Can anyone enlighten me so that I have some thing to come back with. Thanks for looking in, I hope you found the post useful. I see you problem. The thing is that if the house is old, then the surveyor is right to say “It may have a wall tie problem” This sounds harsh but without actually looking at the ties he cannot tell and the fee for a home buyers survey will not cover that. You should certainly not consider a reduction in price without getting the wall ties checked properly. Why not ask a wall tie specialist firm to check them for you. I know that this is risky because you don’t know if they will tell you the truth or not. However, most established firms have a reputation they don’t want to lose, so try it. If they confirm that the ties are OK you are in the pink. If they say not then at least you know that the reduction is justified and that’s that. If you had it surveyed two years ago and the ties were not mentioned, you may have a claim against the surveyor, if that should have been covered. My own company cover Sheffield but by all means get along to the Property Care Association web site or the Wall Tie Installers Federation Web site and get a firm from there. Beware self-proclaimed wall tie specialists without proper trade association membership. Make sure that hey do the survey correctly and try to be on site. A good firm will have nothing to hide and will let you look yourself.